Native to Asia, hibiscus trees grow in gardens and containers across the United States. These ornamental plants are prized for their showy yellow, white, orange or red bell-shaped flowers and glossy leaves, and form attractive hedges, borders, specimen trees or container plant if pruned appropriately. Although considered hardy, certain diseases severely damage hibiscus trees and require immediate attention. Hibiscus diseases include canker, leaf spot, mushroom root rot, collar rot, phytophthora root rot and botrytis blight. Canker is a fungal disease that is identified by the appearance of bright orange-red lumps or fruiting bodies on the bark of the infected tree. Leaf spot disease in hibiscus trees is caused by fungal or bacterial pathogens that vary in size from tiny spots to ones large enough to cover the entire surface of a leaf. These irregular-shaped or round spots are usually surrounded by halo. A brown discoloration that appears at the point where roots join the stem indicates the presence of collar rot. Phytophthora root rot is a soil-borne disease that arises where soils are extremely dry in the summer and extremely wet in the winter. Botrytis blight, also called grey mold is a fungal disease caused by Botrytis cinerea. Symptoms of canker include sudden twig and branch dieback. Dead leaves affected with leaf spot disease appear black, brown or tan, and some are surrounded by a purple or red border. A hibiscus tree that suddenly begins to wilt and then dies shortly after is infected by mushroom root rot or Armillaria tabescens. Leaves of hibiscus trees infected with collar rot turn brown or the trunk near the roots becomes slimy. Roots infected with phytophthora root rot turn reddish-brown and brittle, and the fungi cause the foliage to turn yellow and shed, plant growth to slow down and limbs to die back in the initial stages. The flowers of hibiscus trees infected with botrytis blight develop dark brown fuzzy patches. These patches also appear on the stems and leaves. Prune wood infected with canker and discard immediately to prevent the disease from spreading. Spray Bordeaux on infected parts to cure leaf spot. Prune parts of the tree infected with collar rot and apply a layer of Bordeaux paste over it. There is no cure for hibiscus trees infected with mushroom root rot and phytophthora root rot, so prevention is the only control. Practice proper watering, feeding and pruning schedule so the hibiscus is hardy and does not succumb to cankers in the future. Minimize bark and trunk injuries to prevent pathogens from entering open wounds. 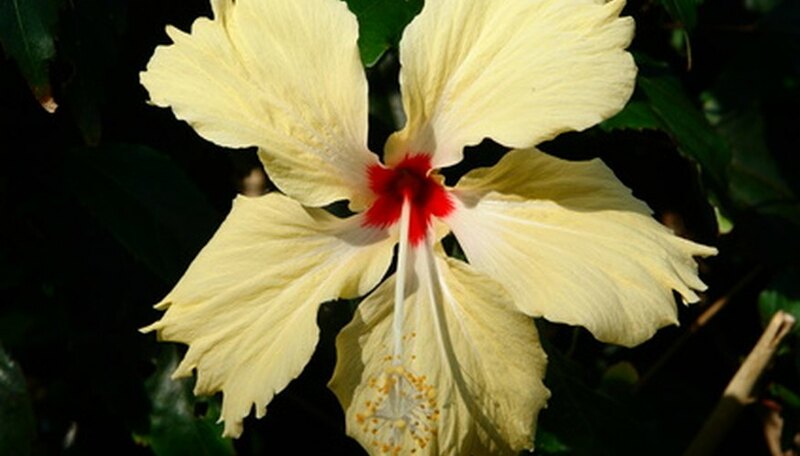 Provide good air circulation to the hibiscus tree to prevent the occurrence of leaf spot disease. Plant hibiscus trees in well-drained soils to prevent mushroom root rot. Plant the hibiscus tree in well-draining soil and avoid stress to prevent phytophthora root rot. Remove spent flowers; avoid wetting flowers and foliage and spray fungicides containing copper hydroxide, mancozeb or potassium bicarbonate as soon as symptoms of botrytis blight occur.